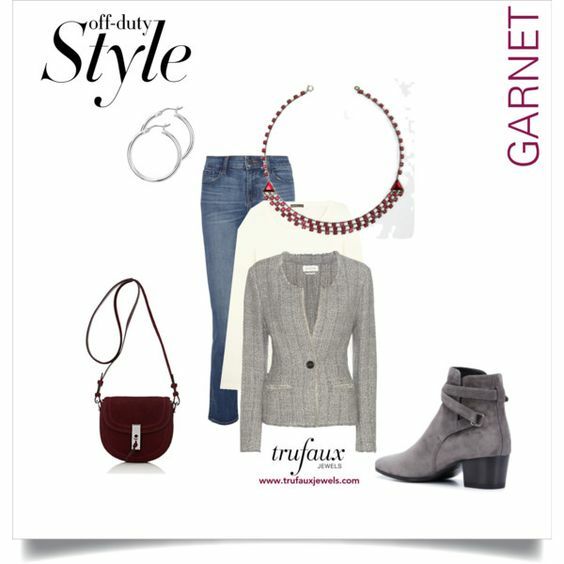 January’s birthstone, garnet, is actually the name of a group of related gemstones that occur in a wide range of colors. 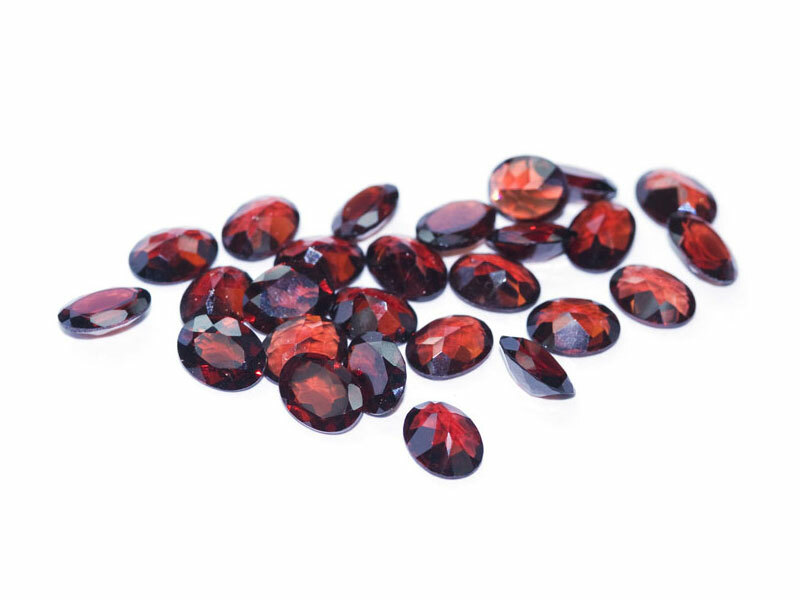 Although red garnets are the most abundant and have the longest history, this gem also occurs in shades of orange, yellow, and green. Red garnets have been prized for millennia: from Egyptian pharaohs and Romans in antiquity, to clergy and nobility in the Middle Ages, to 19th century Bohemian jewelry makers. Red is the color associated with power, passion, and excitement. Color psychologists suggest that we wear red when we want to appear assertive or draw attention to ourselves. If you think red doesn’t flatter your complexion or red clothing is too bold for your personality or work environment, you can still wear this rich hue more subtly, with accessories. 1. This ensemble features trousers in a black, white, and red Prince of Wales pattern, topped with a white round-neck sweater and black denim jacket. Pinned to its shoulder is this Ruby, Diamanté & Rose Vermeil Sterling 1940s ‘Sparkling Peonies’ Duette by Adolph Katz for Coro. A Duette is this maker’s name for their double clip-brooch. This piece has two fur clips attached to a mechanism that allows them to be worn as a single brooch. Or you could wear one or both clips separately. This spectacular jewel has a rose-gold wash over sterling silver and deep-red glass stones. 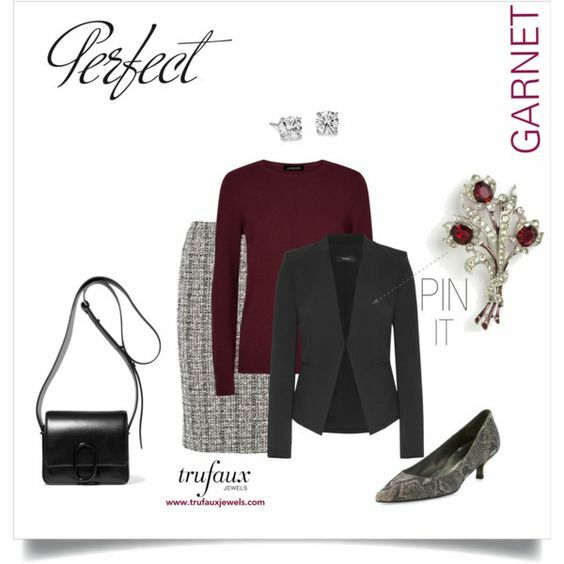 I’ve styled the outfit with diamond studs, but you could wear the matching earrings that come with the Duette. 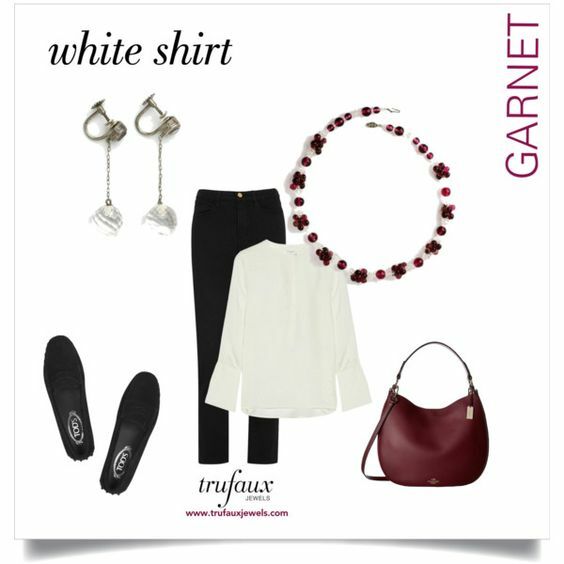 Burgundy ballet flats and a black purse complete this outfit. You could dress it up with a black blazer or a gray suit. 2. The crew-neck top and round-neck jacket in this outfit have the right neckline for this Ruby Chicklet Art Deco Festoon Necklace. If you wear earrings, simple silver hoops or studs would work well. The jewelry takes a simple jeans-and-top outfit to the next level. I’ve used a soft gray tweed jacket, but you could wear another complementary pattern, a solid neutral blazer, or a cardigan just as effectively. 3. I love to wear scarves to combine colors in an outfit and to serve as the basis for the rest of my accessories. 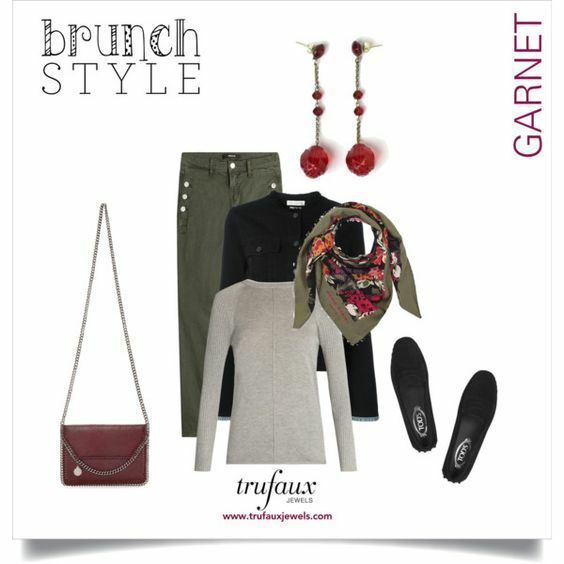 Without the scarf and these Ruby Bead Art Deco Pendant Earrings, this ensemble of olive green trousers, gray sweater and black denim jacket would be really boring. The accessories, including the handbag, add interest with punches of bright red. 4. A black-and-white tweed skirt and black jacket come to life with a burgundy sweater and this Ruby, Diamanté & Enamel Bouquet 1940s Brooch. The deep red in the flowers is repeated in the enamel on the bouquet’s stems. I’ve shown the brooch pinned to the jacket shoulder. If you wear a blazer with a collar, I’d position the brooch there. Diamond studs (real or faux) complete the jeweled accessories. 5. You may have noticed that most of the outfits above have a black-white-and-red theme. But red is more versatile than that. So here I’ve topped brown trousers with a blush shirt and added a scarf that combines these hues. 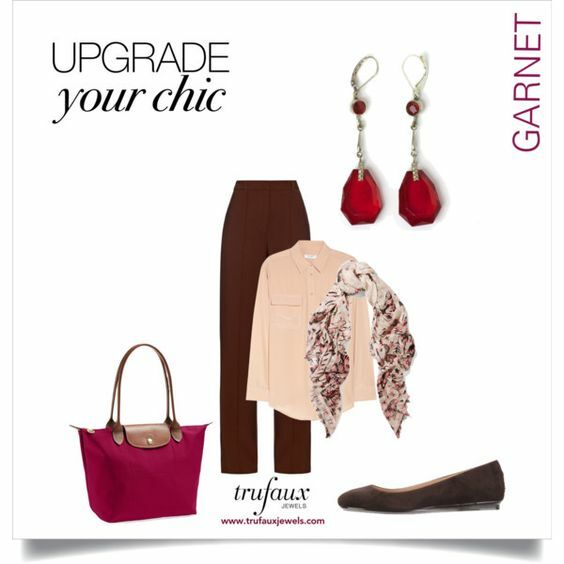 These Ruby Art Deco Pendant Earrings, a red bag, and brown ballet flats complete this look. Have you ever thought of wearing this palette? 6. 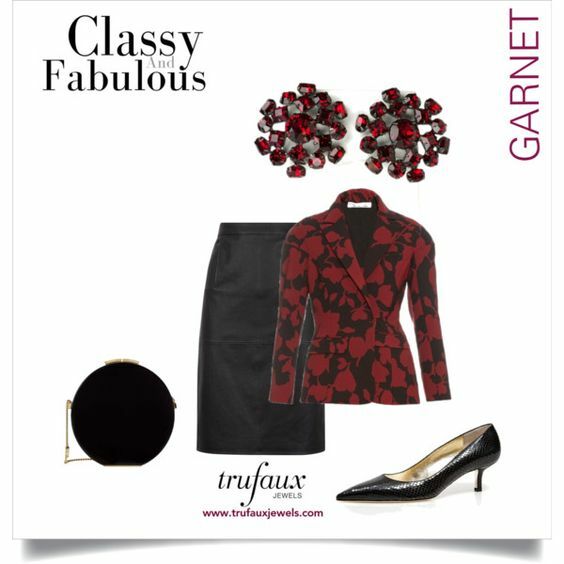 For an example of day-to-evening attire, here’s a deep-red and black flowered blazer with a black leather skirt. The shoes and bag are black, and the only jewels are these Ruby Snowflake 1950s Earrings by Schreiner. With their clusters of deep-red stones in a variety of shapes, these elegant ear clips frame the face with this rich and becoming hue. 7. Here’s another jeans-and-blazer outfit. This time the jacket lapel is adorned with this Ruby, Diamanté & Sterling Art Deco Bar Brooch. 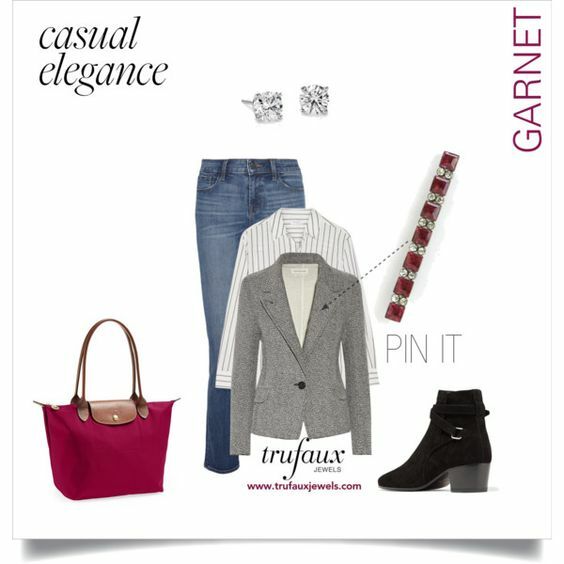 Instead of a herringbone blazer, you could wear another tweed, a solid neutral, or a cardigan. I like this jacket because it has a pattern in colors light enough to allow the brooch to stand out. 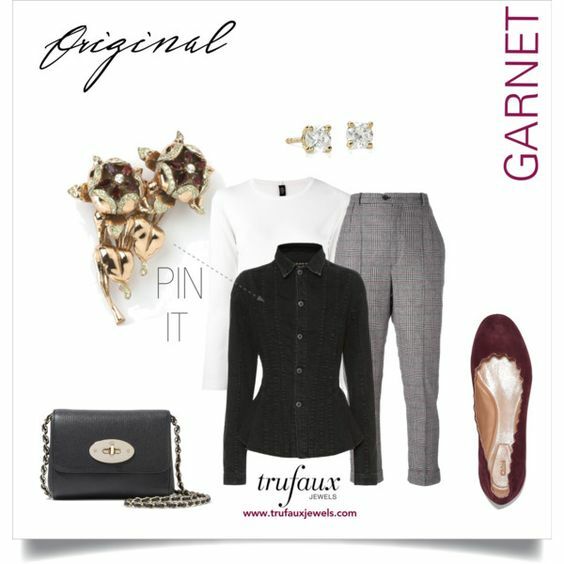 Faux or real diamond studs complement the diamanté in the brooch. 8. 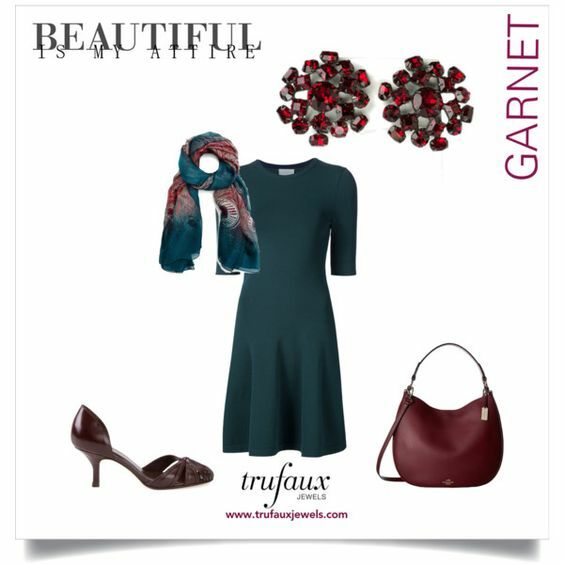 If you’ve never thought of wearing deep red with dark green, here’s a lovely example of this pairing. These colors are complementary because they’re opposites on the color wheel. That’s probably why I was able to find a scarf in this combination. I think the contrast of these two hues is elegant and striking. These Ruby Snowflake 1950s Earrings by Schreiner are just the right shade and shape to add the finishing touch. 9. Black trousers (or jeans) and a white shirt are a great blank canvas to create many different outfits just by changing the accessories. 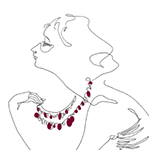 In this example, I’ve added this Ruby Bead and Crystal Art Deco Necklace to this round-neck blouse. If you wear a shirt like this one, you can unbutton it to reveal the necklace. Two pairs of earrings with crystal beads are available – here’s one pair with screw-backs (which can be converted for pierced ears). You could wear diamond studs, if you prefer a more subtle look. Click through to see my January Birthstone collection.